the involvement of the Indian stretcher bearers and the African Scouts during the siege and conditions experienced by civilians and military during those 118 days. 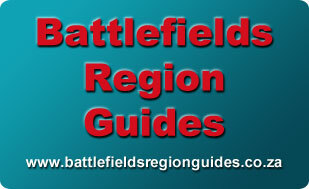 The importance and positions of the Boer “Long Tom” guns and positions on the hills surrounding Ladysmith are discussed. 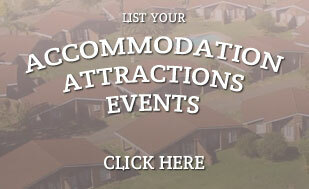 Sickness and disease, the spread of enteric fever and the establishment of INTOMBI CAMP. Christmas 1899 and the “complements of the season” shell! February 1900 General Sir George White V C and the British defenders still grimly holding on . General Sir Redvers Buller V C to the relief the last day of February 1900. On leaving the museum, on the monument note the names to those given the freedom of the town which includes the famous “sons” of Ladysmith the LADYSMITH BLACK MABSAZO. 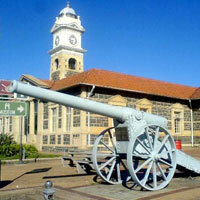 The Ladysmith Town Hall was built in 1883 and the clock tower was damaged by the fourth direct hit during the siege. Outside the Royal Hotel and note the shell grouted into the pavement. 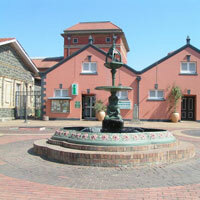 Opposite the hotel stands the Dutch Reformed Church a national monument. 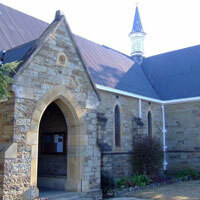 Continue to the All Saints Anglican Church where all the names of the British soldiers who died in the defence and relief of Ladysmith, are inscribed on marble tablets. Continue past the Old Toll House along the Klip River towards King Street into Poort Rd past the H Q of Sir George White at 16 Poort Rd. Turn back into Keate Street pass the Methodist Church and the Oval shopping centre where the original Pavilion still stands built in memory of Queen Victoria’s Jubilee. Continue past the library where the curfew bell stood during the siege. Turn into Murchison Street walk to the Hospice Shop a fine building which was owned by W Neizel during the siege ,cross the road to the old Railway Institute another interesting building built in 1903 also a National Monument ,then meander back to the Siege Museum passing on the way some very attractive Indian trading shops. Return to transport , drive to Gandhi Statue ( unveiled 1970) next to the Lord Vishnu Temple (in Forbes Street) continue passing the Soofie Mosque – the present mosque was built in 1969 and is a national monument. Cross the Wagon Bridge to Platrand Lodge turn off ( 5klms). Lunch Break Platrand lodge ( Optional ) ? Afternoon : Tour of Platrand and Wagon Hill. 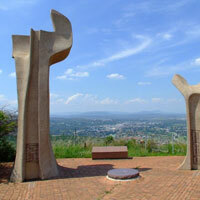 At the Burgher Memorial you will have an introduction and overview of the Battle of Wagon Hill January 6th 1900, the Boer attack on the British outer line of defence. Continue to far end of hill to plaque recently unveiled to the Manchester Regiment namely Private Robert Scott V C and James Pitt V C.
Drive back past the Burgher Memorial to Wagon Hill where in the early hours of the morning of January 6th the Harrismith Commando attacked the hill, fierce fighting continued all day long , it was here late in the afternoon the Devonshire Regiment with bayonete`s fixed charged across the open ground , during a violent thunderstorm they succeeded where all else failed and saved the day for the British. Other monuments to visit are the Devonshire Regiment and Rev Kestell amongst many others. , Access to the Wagon Hill Cemetery is over a stile. 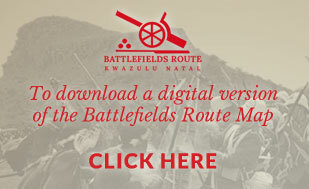 Meet at the Ladysmith Siege Museum proceed to Spion Kop scene of one of the bloodiest and most futile battles fought during the Anglo Boer War. 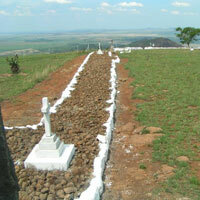 Drive to the top of the hill and walk the battlefield passing the mass graves of the British soldiers who were that day so vulnerable to the close range Boer rifle fire and shells from the Boer artillery. Remember the three men who were to become great leaders, Winston Churchill Mahatma Gandhi and Gen Louis Botha. All three were involved on that day of January 24th 1900. Spion kop was the second attemp to relieve Ladysmith by General Officer Commanding the Natal Field Force , General Sir Redvers Buller. The British forces withdrew 24hrs after reaching the top of the hill. Proceed to the site of the armoured train incident and the capture of Winston Churchill then Chieveley cemetery where Lord Roberts only son, Lieutenant Freddie Roberts is buried. After a packed lunch or lunch stop en route proceed to Clouston Garden of Remembrance General Buller`s H Q for the Battle of Colenso December 15th 1899. overview of the battle and the attempt to cross the Tugela River by Major- General Firzroy Hart of the 5th Brigade. 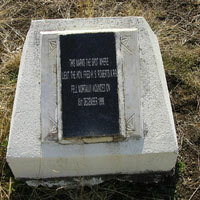 Site of the Guns, Colenso. At the site we will discuss the loss of the guns, capture of the abandoned guns by the Boers, Freddie Roberts attempt to save the guns and being mortally wounded. Seven V C `s were awarded but the British suffered heavy losses -143 killed, 756 wounded, 240 captured and missing. 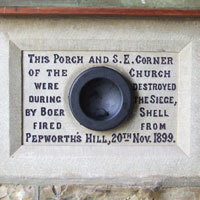 Boer losses 8 killed 30 wounded .On December 16th Boers celebrated the “Day of Vow” afterwards General Schalk Burger and General Louis Botha addressed the men from one of the captured guns. Messages of congratulation arrived at Botha`s headquarters from both republics including ones from President Kruger and Steyn. The Battle of the Tugela Heights .The final breakthrough. An overview from the Somerset Light Infantry Monument , Hart`s Hill and the relief of Ladysmith. General Sir Redvers Buller finally breaks through dislodging the Boers from Harts Hill ,Railway Hill and Pieters Hill . February 28th 1900 Major H de la P Gough and composite regiment of mounted infantry scouted ahead, informing Dundonald the way ahead was clear. After passing Intombi Camp and crossing the Klip River, they entered Ladymsith. . WHAT A RELIEF after the 118 day siege! 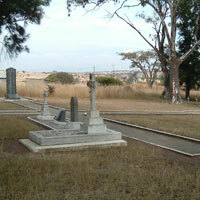 Early on the morning of the 28th Boer wagons moved north and the remaining two” Long Toms” went with them . The end of the Siege but only the beginning of a long drawn out war.